Phased Array Ultrasonic Inspection: A Reliable Tool for Life-Assessment of Low-Pressure Turbine Components. IMS Experience 2001-2005. The paper presents a summary of capability demonstration and crack confirmation during a five-year [2001-2005] field application of phased array ultrasonic technology on low-pressure turbine components manufactured by General Electric, Westinghouse, Alstom/ABB, Siemens/Parsons. Different aspects of capability demonstration process are illustrated and commented. Crack detection and sizing examples in disk rims, rotor steeples and blade roots of different turbine types are presented and compared with 3-D stress analysis, MP indications, metallographic replicas and fracture mechanics results. A summary of phased array ultrasonic reliability components used by IMS-OPG is also presented and commented. The paper will focus on reliability process of PA capability. Different aspects of this process will be discussed and illustrated, such as pattern recognition, redundancy in detection and sizing, probe-defect relationship using forward-inverse ray-tracing problem, confirmation of FE stress areas on components, possibility and limitation of PA to avoid false calls or missing fatigue/SCC cracks. Comparison between PA calls and MP/fracture mechanics results are illustrated. Field aspects and defect co-ordinates - PA results correlation lines are commented. Lack of representative samples, defect population, and systematic studies on possible failure mechanisms led to a sketchy procedure qualification. Most ISI groups, including OEMs [14-20] are qualifying the procedures on EDM notches. Little to no data is reported on service-induced cracks, corrosion pits, missed cracks and false calls. De-blading and MP/replica inspection are costly, but are the only way to confirm the capability / reliability of in-situ (on powered stands) phased array inspection. There is no Designated Qualification Organization and most of the Design Responsible Organizations (DRO) issue the inspection specification based on phased array detection capability on EDM notches. Stress corrosion / corrosion fatigue cracks artificially induced on steeple grooves, disk rims blade roots, disk keyways are very costly, hard to control and QA documented. Confirmation of phased array calls requires physical destruction of the sample rendering it unavailable for future use in support of service provider qualification or procedure improvements. The qualification of phased array procedure for low-pressure turbine components is lacking in the process. The reasons mentioned above lead to the concept of capability demonstration, not to performance demonstration. The most common sensitivity adjustment is to set the noise level on the components at 10-15% and report indications with SNR > 3:1 (10 dB) above this level. This conservative approach led to false calls and costly de-blading. 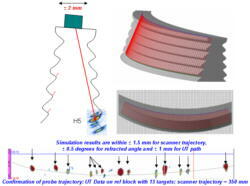 On the other side, to miss a real SCC, which might be detected by MP inspection after de-blading, will put the reliability of phased array ultrasonic techniques in jeopardy . Figure 1: Example of low-pressure turbine components and their complex shape. Adopt ENIQ[22-25] approach (minimum three targets, technical justification, simulation of inverse problem, assess essential variables, probe characterization, increase the population of 3-D crack like defects, retired-for-cause items with real defects, refine the techniques and scanners performances to avoid false calls and/or missed cracks). Perform open/blind tests on retired-from-service items with fatigue/SCC, corrosion pits. Specific aspects of capability demonstration are presented in the next sections. Probe-defect relationship was established based on Imagine 3D and Simulation module. Examples are presented in Figure 2 and Figure 3. The high-speed productivity was based on optimizing the probe trajectory, the number of useful angles and the scanning ultrasonic range. Customized analysis tools were developed for general and specific defect evaluation. Figure 2: Example of simulation probe-defect position for L-1 steeple inspection-Siemens/ABB 850-MW turbine. Figure 3: Example of probe trajectory optimization to detect linear defects on hook 5 convex side of L-0 rotor steeple Simens/ABB 850-MW turbine (top). A diversity of 13 EDM notches was used to confirm the simulation for probe trajectory, detectability angle (bottom). Figure 4: Example of multi-purpose mock-up used for procedure validation and field inspection of Siemens/Parson low-pressure turbine of 580-MW. 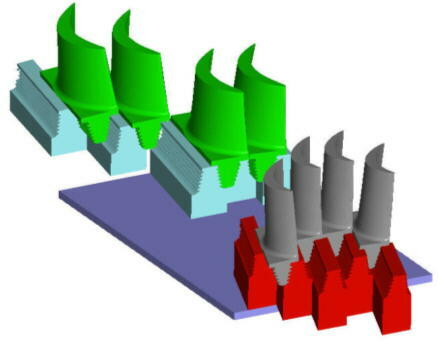 Figure 5: Example of 3-D complex EDM notches cut in row 10 blade (left) and PA results (right) - Siemens/Parson 580-MW turbine. Figure 6: Example of sensitivity setting on fatigue crack for L-0 blade Westighouse 1,300-MW turbine (courtesy South Texas Project NGS). Figure 7: Example of custom-built phased array probe to inspect L-1 steeple of Alstom/Siemens 850-MW turbine. Figure 8: Example of custom-built probe to inspect row 9 blade Siemens/Parson 580-MW turbine. 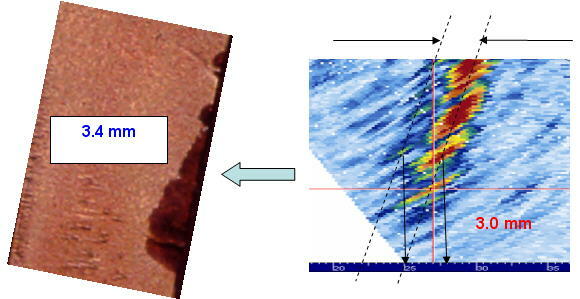 Figure 9: Example of pattern recognition of SCC versus corrosion pits using different angles and high-frequency linear array probes for disk-blade rim attachment-GE style 850-MW turbine. Life-assessment tool is missing due to lack of data, namely the crack depth. Some examples of the problems mentioned above are presented in Figure 10 and Figure 11. Figure 10: Example of steeple grooves damaged (left), corrosion pits and surface texture (middle), and missed crack on rotor steeple (right) due to orientation, cleaning, MP procedure technique. Figure 11: Example of missed cracks by MP in the field and detected by PA and re-confirmed by MP in the lab with a better cleaning and MP technique; Left: fine cracks missed at the bottom of platform; Right: MP declared the blade OK; phased array detected corrosion pits and small crack (top) and multiple cracks (0.5-1.0 mm depth) at the bottom of platform. A comparison between PA and fracture mechanics is presented in Figure 12 to Figure 14. 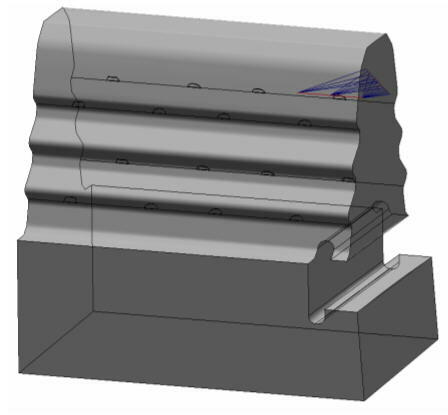 The location of cracks on Siemens/Parson low-pressure turbine is matching the stress distribution given by finite-element modeling (see Figure 15). 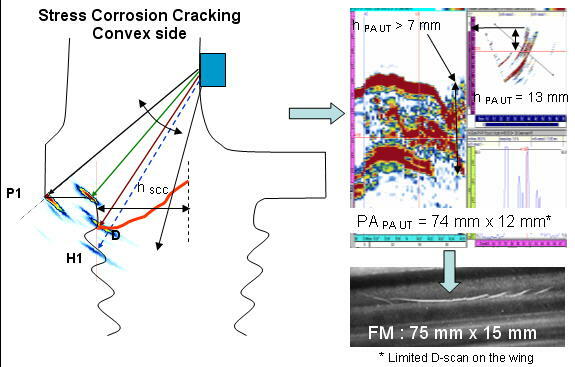 Figure 12: Detection and sizing of multiple small fatigue cracks by phased array (a). Confirmation of four cracks of 15 mm (total length) by MP detection (b); Fracture mechanics analysis (c) and comparison between fracture mechanics and PA results (d). Figure 13: Example of comparison between fracture mechanics (left) and phased array crack height evaluation (right). Figure 14: Confirmation and sizing of SCC on blade convex side by wing technique (left and upper right). Comparison with MP and fracture mechanics data (left). Figure 15: Example of correlation between FE stress distribution, PA data and fracture mechanics for L-1 blade Siemens/Parson 580-MW turbine Nanticoke TGS. It is a big difference between the detection capability in the lab and industrial scanning with high productivity, during a night shift, in 85+ dB noise, humidity and difficult positions (see Figure 16). However, cracks were found, aligned corrosion pits and micro-cracks were the limits of PA detection. Patterns learned in the lab may change in the field due to crack morphology (see Figure 17). Figure 16: Example of large-scale inspection on two LPs - Alstom/ABB 850-MW turbine. Figure 17: Detection of shallow and deeper crack on L-0 steeple hook 1-ALSTOM/ABB 850-MW turbine (left). Crack morphology obtained with acetate replica (right). Analysts reported 45 mm long x 4 mm deep. PA team reported to the station 150 mm x 0.5 mm + 45 mm x 4 mm. Crack length and height was confirmed by MP and grinding (see Figure 18). Figure 18: Confirmation of a shallow and deep crack on L-0 steeple, hook 1 by MP (left) and grinding (right). Figure 19: Example of detectability limits for phased array techniques. Aligned corrosion pits and cracks located just under the platform, undetected by technique 1 (wing) and detected by new technique (2). If the cracks are too small and located close to a large geometric echo, they can be undetected by phased array, unless they have a height greater than 2 mm (see Figure 19). False calls may be produced if the corrosion pits are aligned and produce a similar signature with a SCC (see Figure 20). Confirmatory techniques didn't conclude a crack-like pattern. Station decided (conservative approach) to de-blade. No crack was found, but only accumulative corrosion pits were detected which may develop into SCC with continued operation. Data analysis and 2-D / 3-D plotting help PA team to avoid the false calls caused by geometric irregularities (see Figure 21). Figure 20: Example of false call due to aligned corrosion pits. Figure 21: Example of OMNISCAN data (right) plotting into 2-D specimen layout (left) to explain the defect and geometric location when inspecting Siemens/Parson blade roots. Figure 22: Example of 2-D and isometrics plotting of PA data into L-0 steeple (left) and blade (right) - ALSTOM/ABB 850-MW turbine. The overall performance of phased array for length and height evaluation is presented in Figure 23. Figure 23: Correlation between defect dimensions and phased array data for : left- length; right - height. The powerful tools of phased array are sectorial scan, focus beam, pattern recognition and data plotting. 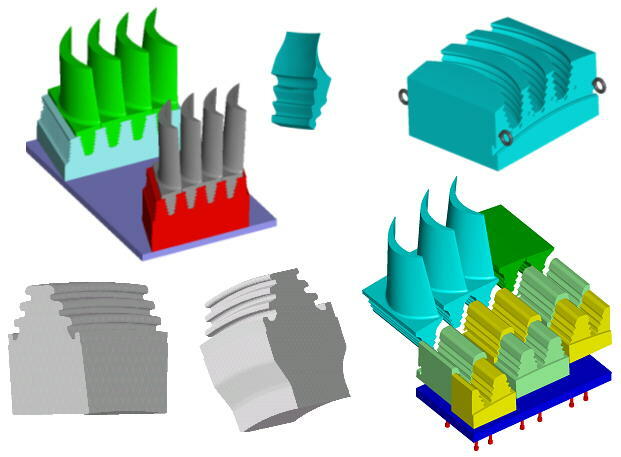 When all reliability factors are taken into consideration, phased array technology is a very useful tool for life-assessment of low-pressure turbine components. The authors wish to thank: OPG-IMS Management for their support and granting the publication / presentation of this paper. Many thanks to IMS technicians and external contractors which participated in feasibility studies, capability demo, procedure(s) validation, field inspections and defects confirmation / reporting using phased array ultrasonic technology during 2001-2005 inspection campaigns. Special thanks to OPG Pickering, Darlington and Nanticoke Turbine Equipment Departments and Bruce Power Turbine Group for their support in funding the application of phased array technology for turbine components. Special thanks to South Texas Project for allowing publishing / presenting some of OPG PA results on Westinghouse blades. Thanks to: SITCO, CAD WIRE and Focal Point NDE for reverse engineering, complex EDM notches manufacturing and CAD drawing integration into Ray tracing / simulation software Imagine 3D.